Rose's Ross Barbour with Hearts skipper Christophe Berra who made his return after injury at Prestonfield (pic by Michael Gillen). Linlithgow Rose welcomed Heart of Midlothian on a stormy evening at Prestonfield as the club officially opened their floodlights. The visitors were led out by captain Christophe Berra marking his return from injury and they were immediately onto the front foot winning an early corner. The hosts were however first to try their luck with Ross Barbour seeing a speculative effort go over the bar and in response Aaron Hickey had a shot go wide for Hearts. Despite the poor underfoot conditions both sides were trying to pass the ball and good play from Roddy MacLennan put in Owen Ronald but a fine tackle from Hickey prevented the opportunity. On the quarter hour Kyle Marley had to be on his toes to save a drive from Craig Wighton before visiting stopper Kelby Mason made a good stop from MacLennan. Linlithgow had another good opportunity from a set piece, Ronald swung in a corner and Jamie Mackenzie headed narrowly over at the back post. However the deadlock was to be broken by the visitors on 30 minutes with Wighton picking up a loose ball before firing low into the corner of the net. Connor Smith almost doubled the advantage with a decent effort before the second came on 41 minutes. The energetic Alex Pektov fed the ball into Wighton and the striker slotted the ball in from close range. Hearts were on the offensive immediately at the start of the second period with Euan Henderson going around keeper Marley before shooting over. Smith was next to try his luck, but Marley was again equal to his efforts. The strong winds and heavy rain continued to have an impact on the game with the park becoming extremely heavy and sticky but both teams continued to play football. On the hour Ronald had a shot saved prior to a whole raft of substitutions being made. 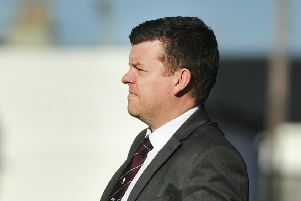 Tommy Coyne had a header saved from a good position after a Barbour cross prior to Leeroy Makovora having two shots saved by substitute keeper Michael McKinven as Hearts looked to seal their victory. In the closing stages Smith almost put the icing on the cake for the visitors but he curled his shot narrowly wide and there was to be no more goalmouth action. Rose’s Roddy MacLennan was happy with the display: “It was a good experience, it’s always fun to play against quality teams, you get more time on the ball. 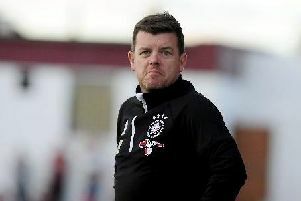 “The pitch ruined it as a spectacle at times, but it was good for the younger boys to play a team like Hearts, that’s the level they aspire too. “We performed well in the first half and created some good chances, in the second half they controlled the game, it was pretty one way, so the result was decent.